Does teacher professional development make a difference? How do we know? Evaluating the impact of teacher PD is inherently problematic for schools, where it is often the weakest link in the PD chain. The difﬁculty for schools may lie with a lack of appropriate expertise and inadequate tools to carry out such evaluations. It has been a professional focus for me this past academic year to seek ways of formally evaluating the impact of our PD initiatives on teachers’ professional learning and students’ outcomes. Changing the focus from what we do to focusing on the difference we are trying to achieve. Have identified a specific area of learning they are trying to improve for an identified cohort of students. Are able to identify some objective tools and assessments to help them see if they are having genuine impact. Are given repeated opportunities to try implementing and improving approaches, evaluating impact then reflecting and discussing this with colleagues. How do we identify needs? Range of different strategies – pupil outcomes, feedback from staff, appraisal meetings, pupil progress meetings, upcoming changes, etc – As many staff as possible have some opportunity to feed into this needs analysis. Empowering teachers and subject teams to solve real learning problems, CPD is therefore more relevant and easier to evaluate. 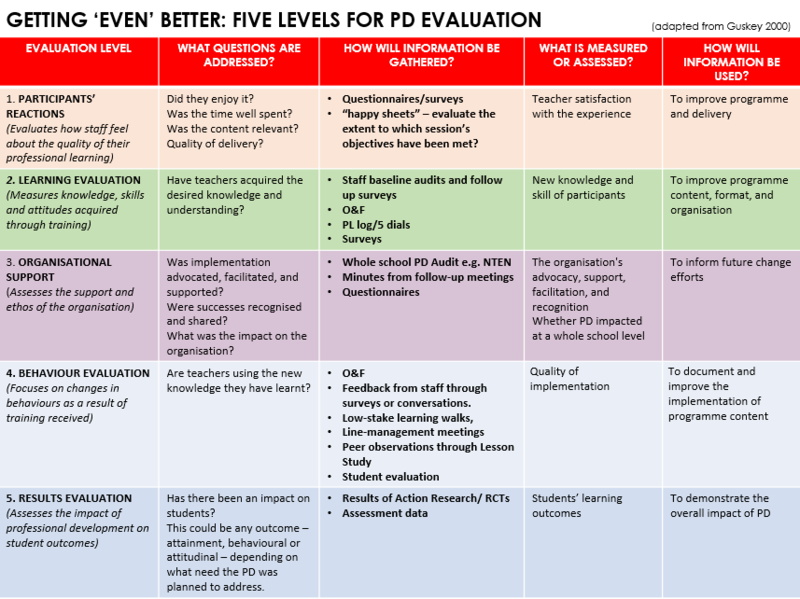 Ideally we want any aspect of our PD programme to reach levels 4 and 5, in that it leads to positive changes in teacher practice and improves student outcomes. Teachers identify teachers identify specific classes, groups of students and aspects of their classroom teaching or their students’ learning that they want to change as a consequence of their professional learning. Participants need to see and measure the impact they are having. What will student learning look like when my learning is effective? What tools and approaches can I use to objectively check if I’m making a difference in pupils’ learning? Have I made a difference yet? There are three main implications that stem from this model for evaluating professional development. Firstly, each of these five levels is important. The information gathered at each level provides vital data for improving the quality of your professional development programme. Tracking effectiveness at one level tells you nothing about the impact at the next. It’s important to be aware of the difficulties involved in moving from professional development experiences (Level 1) to improvements in student learning (Level 5) and to plan for the time and effort required to build this connection. Thirdly in planning professional development to improve student learning, the order of these levels must be reversed. You must plan “backwards”, starting where you want to end and then working back. In backward planning, you first consider the student learning outcomes that you want to achieve (Level 5). For example, within English, do you want to improve students’ reading comprehension or perhaps enhance their analysis skills? Then you determine, on the basis of pertinent research evidence, what instructional practices and policies will most effectively and efficiently produce those outcomes and set up your own classroom based research. What underpins the success of powerful professional development is that organisational support (Level 3) needs to be in place for policies and practices to be implemented. Aspects of the organisation can pose barriers to implementation, embedding whole school policy change needs wider support, both from teaching staff and Senior Leadership Teams.